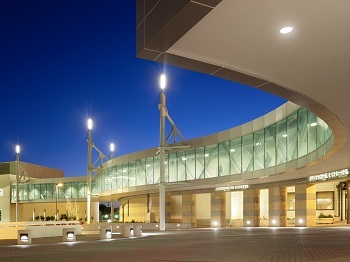 Winner of the 2010 SEAOC and 2011 SEAONC Excellence in Structural Engineering Awards as well as the ASCE Project of the Year Award for 2011. This new pedestrian bridge connects the existing Catholic Healthcare West St. Joseph Medical Center hospital to the new Women & Children's Pavillion hospital wing across the street. ESE is the structural engineer of record for this project. 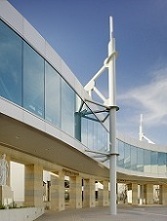 The three dimensional space frame developed by ESE for the bridge deck, roof, and walls is supported on steel columns outside the bridge footprint maximizing structural efficiency and aesthetic values, while at the same time minimizing interference with existing improvements, parking and the roadway. Construction was completed in 2010.